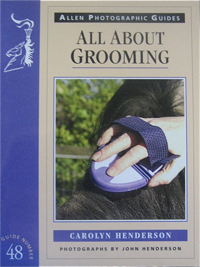 All About Grooming Carolyn Henderson brings you a wealth of advice with the aid of lots of photographs on correct grooming and bathing techniques for horses. The must haves on equipment, how to safely work around your horse, spot cleaning and bathing, picking feet and much more. A handy photographic guide that you can use in the barn. Whatever the lifestyle of your horse or pony, Carolyn has brought her British no nonsense style to the text here to fully explain the best routines that will be effective and healthy for your horse. Presenting your horse for a show or bringing him home muddy from a trail ride, working summer or winter - it's all here. Some useful tips on utilizing products such as witch hazel to remove grease from manes, short cuts for the busy owner, and other professional tips that will work well for the busy owner. We also have Carolyn's books on Show Secrets, a photographic guide like this one on clipping your horse and her husband John's book on transporting horses. Both authors are highly respected in both the photographic and journalist fields and have extensive personal experience in the show world. Contributing to such notable publications as Horse and Hound, Horse and Rider and much more.